OKLAHOMA GOVERNOR MARY Fallin postponed at the last minute the execution of an inmate who claims he’s innocent, after prison officials said one of the three drugs they had received to carry out the lethal injection didn’t match state guidelines. The state Department of Corrections reached out immediately to the attorney general’s office once prison officials realized they received the wrong drug for use in Richard Glossip’s execution, according to Fallin spokesman Alex Weintz. Oklahoma’s protocols call for the use of potassium chloride, but the state received potassium acetate instead. Weintz said the department receives its lethal injection drugs on the day of an execution. Attorney General Scott Pruitt’s office advised Fallin and prison officials that the state’s lethal injection guidelines, which had been upheld by the U.S. Supreme Court, had to be followed, said Pruitt spokesman Aaron Cooper. “It is unclear why, and extremely frustrating to the attorney general, that the Department of Corrections did not have the correct drugs to carry out the execution,” Cooper said. Fallin reset Glossip’s execution for November 6, saying it would give the state enough time to determine whether potassium acetate is a suitable substitute, or to find a supply of potassium chloride. Dale Baich, an attorney for Glossip, said he was informed in a letter from the attorney general’s office last month that the Department of Corrections had already obtained the potassium chloride and other drugs needed for the execution. 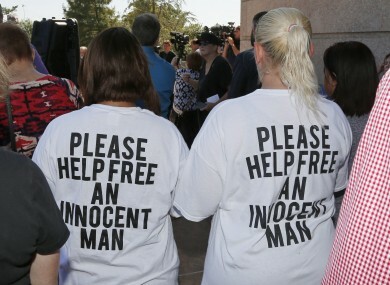 Hours before Glossip was scheduled to be executed September 16 for ordering the 1997 killing of Barry Van Treese, the Oklahoma Court of Criminal Appeals granted a rare two-week reprieve to review his claims of new evidence, including another inmate’s assertion that he overheard Justin Sneed admit to framing Glossip. Glossip has long claimed he was framed by Sneed, a motel handyman who admitted to fatally beating Van Treese with a baseball bat, but said he did so only after Glossip promised him $10,000. Sneed, who is serving a life sentence, was the state’s key witness against Glossip in two separate trials. Email “Execution postponed after the wrong lethal injection drug was sent to prison”. Feedback on “Execution postponed after the wrong lethal injection drug was sent to prison”.